... assuming you actually had the chance to do so instead of a uncontested walkover. But for those who voted, I wonder if they have any regrets today? Is this the Gahmen you envisioned when you cast your ballot back in 2006? Is it just me or is anyone else also feeling that this Gahmen of ours is very cold and unfeeling towards its people? The very same people who voted them into Parliament and pay their salaries? I look at what Hong Kong is doing for their people over the credit linked securities fiasco and then I look at our own Gahmen. One problem. Two different attitudes. Here's a thought. Perhaps the silence on the part of the Gahmen with regards to this issue is not that they are unconcerned of the plight of a mere 10,000 people of our a population of 4,000,000, but rather, could the real reason for the silence be that our million dollar ministers actually DON'T KNOW what to do? Though a very unlikely thought but possible nevertheless. So it is just me or are people starting to get slightly disillusioned with the present Gahmen? I think it will be a vastly different scenario come the next election. People will actually pay more attention to the candidates fielded by the various parties, especially the new ones. I have always been against the idea of the GRC where new candidates get in under the hood of the solid incumbents untested. I am also against the idea of tying a carrot (e.g. HDB upgrading) to a certain political party when the carrot is meant for every Singaporean regardless of political affiliation. Now that there isn't any solid incumbents to really speak of these days with the exception of perhaps our two ex-Prime Ministers and Prof Jayakumar*, the rest of the incumbents running in GRCs may be at risk should they try the same trick again. We may just pull them down with the rest of the clowns they try to smuggle into Parliament. As for carrot. Same thing. You can't pull the same trick twice. Besdies, HDB upgrading is more or less completed everywhere. Everywhere sans Potong Pasir and Hougang, of course. So what does that mean for the future elections. Simple. As long as the opposition parties can put up a credible candidate. We may just vote for him. He/She doesn't have to be a superstar. As long as he/she is "good enough", we will give him/her a shot. It's not like we have never voted for a candidate that turned out to be a dud anyway. We do not want an opposition MP for the sake of disrupting the Parliament and just oppose for the sake of opposing. Save the throwing of bananas and punch ups for the circus. We just want representatives from the other side to provide a stronger and more credible check and balance to the Gahmen's various decisions. Besides, it's not like PAP will lose control of the Gahmen in the near future. 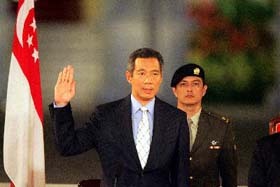 I expect PAP to return to power for overall, just a small number of their policies are questionable. In short, we prefer to see future policies passed after greater scrutiny and more thought. This can happen only with more credible opposition candidates in parliament.